Lilies are so naturally elegant - often tall, always delicate, and as delightful in the garden as cut flowers in the house. We feel this image is similarly elegant, delicate, delightful - and suited to being worn casually out and about, yet also at more formal events. 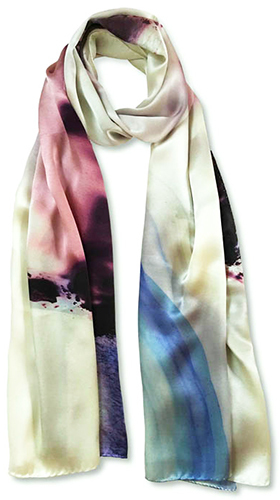 It's actually an agate formed at huge temperatures during volcanic activity millions of years ago, but no one would ever guess that looking at it as a beautiful, soft silk scarf. In this oblong shape the image has been poositioned so that when it is worn the very best of the image is visible.